Good morning Nosh Show listeners! Episode 49 is here and the gang is all here! Ryan's drinking coffee, I'm drinking Rooibee, Marvo's hopped up on Kickstart, and Eric.... is ten minutes late. Curse you Junk Food Guy!! Hehehe, just kidding, I'm glad to have everyone back. It's time to talk ice cream, lots and lots of ice cream. It's my kind of episode. Stonyfield Oh My Yog! is an organic trilayer yogurt made up of a whole milk cream top, yogurt, and fruit... with a touch of honey. 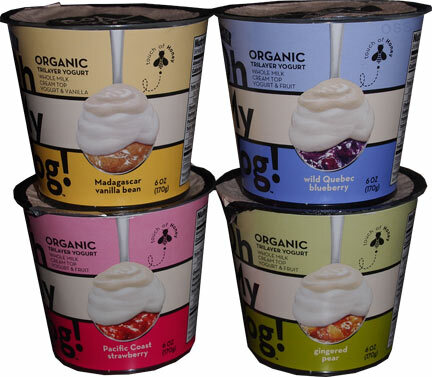 The 6oz container has an easy to remove cardboard wrapper that contains an "Oh My Yog! Moment" inside. Let's start with Pacific Coast Strawberry. I'm going to cheat and shake it before I open it so I don't have to stir much. There's lot of strawberry bits.... will this be as good as the first impression the apple made? Hmmm, surprisingly, the strawberry isnt as potent as I had hoped. Oh, it's a fine product, don't get me wrong, there's just a bit of... memory correction shall we say. This is why I added my favorite honey roasted honey bunches of oats granola last time to seal the deal. But before I do, I just want to note an almost cheezy vibe to this product that stands out a bit more than last time. Again, this is not a bad thing, just something I need to prepare for. Ok, now some bites with granola.... mmm, way too much granola. I think the only problem here is that the apple was so unique, I set my expectations a little too high here. I will be more prepared for the next one. Ok, today I am trying the Ginger Bear, I mean Gingered Pear flavor, hehehe. My son wanted to pick my yogurt today, so after reading him the three labels, he said the gingerbear sounded best. Oh he's cute, but anyway, let's talk yogurt. I open it up and it smells like... the apple cinnamon version I tried first. I take a bite and it takes like the apple one too. I know I'm not necessarily great at noticing subtle differences, but I dont get the taste difference. The only thing I really notice is that the pear pieces are sizable here, which is fine by me, I think it's a great fun factor.... and I've already eaten over half the yogurt. I'm enjoying it, plain and simple. Mmmm, good with granola too. Yeah, I'm getting this one again. Alright, time for wild Quebec blueberry. Smells earthy, you know, like a tea would. Kind of tastes like tea too. It's funnny how I love the non traditional flavors (apple/pear) but having trouble relating to my typical flavors (strawberry/blueberry). It's not bad, it's not that, it's just unexpected... which means granola time! Mmmm, I do love my honey bunches of oats granola.... may have poured in a little too much. Ok, the whole blueberries are cool, but I do get that tea vibe from time to time. Alrighty then. Ok, that leaves Madagascar vanilla bean in my lunch bag today. The big question is do I mix in Granola or Oreos? Wait, I forgot my Oreos, so nevermind then. I try a bit of plain base and well, that's not my thing. I try a bit of the vanilla goop at the bottom and it's oh so sweet. Must resist urge to eat that straight. I mix it up and I like it. It continues the fun sweet dessert vibe that the apple and pear had. Thumbs up. WAIT! I found Orange Cranberry at Market Basket this weekend. Now I know it's meaningless, but the visuals of the packaging make you think it's a 1 to 1 to 1 ratio of the three ingredients, but the reality is, the cream layer is very thin, like almost imperceptible unless you look very closely. I tried photographing this one and the gingered pear without much success (I tried drawing in the line to point out the layer but even that didnt work). No matter though since I'll stir it all up anyway. I like this one, but I'll admit that I was hoping for mind blowing. I wanted to be wowed with flavor one more time. It's better than the strawberry and blueberry, but not as strong as the pear or apple. In fact, it kind of tastes like the pear or apple which is odd considering it's suppose to be orange cranberry. It's fine, I'll put it in the race for third with vanilla bean. If they were the only two on the shelf, I'm not sure which one I would grab.... ahh, I would just grab one of each. Well, that's it, I've tried them all and I will definitely be buying them again. In general I eat yoplait, but it doesnt always settle well. I'd rather spend a bit more and get these. They just need to build me a strong raspberry flavor and I'll be all set. Disclaimer: Since they aren't cheap at a $1.50 a piece, maybe buy just one to start to make sure you like it (that's what I did). Good luck! Sept 2015 Update: These are pretty much the only yogurts I eat now, usually the pear or the apple. The only catch is that I wait until they are on sale for a dollar a piece. 2017 Update: They've shrunk these down to 5.3 ounces a piece. I know that's only about 10%, but it feels like a lot when you are eating it, especially since I want them to be bigger anyway. End of 2017 Update: I think Oh My Yog is gone.... not cool. The gingered pear Oh My Yog is the best. The entire experience is a rich,creamy one with a little spice. I add some walnuts and am satisfied and feel like I have had a pretty good breakfast. These are a lot better if you don't mix them. Based on the spoon illustration on the container, I assume that is how it is meant to be eaten. Personally, I think they are best when you mix the first 2 layers together to get out the separated dairy and then eat it with a hint of the fruit.